The dark nights herald months of hibernating but also bring with them the time of year when shellfish are sweetest. I am a sucker for shellfish and rarely pass up the opportunity to order it when we’re out. Our local farmers’ market has a good fish stall and their array of seafood draws me in every time. 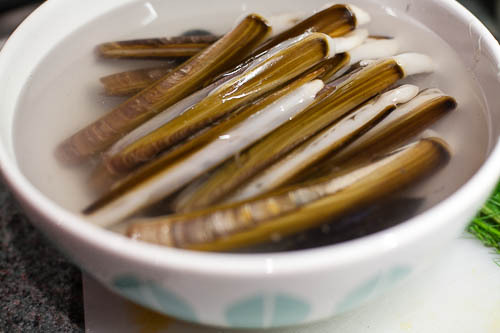 A few weeks ago they had bundles of razor clams which I couldn’t resist. I went back and fourth on how I would prepare them but once the idea of paella had taken hold I knew that’s what we needed. In the Autumn and Winter particularly, I feel the need to spend time cooking. To make nourishing meals which bring us together in the kitchen before a meal as much as they do during. I find cooking paella for our Monday supper is a wonderful antidote to the sudden early evening darkness we’re plunged into. The golden spice, deep paprika and sweet shellfish are as comforting as any pie. 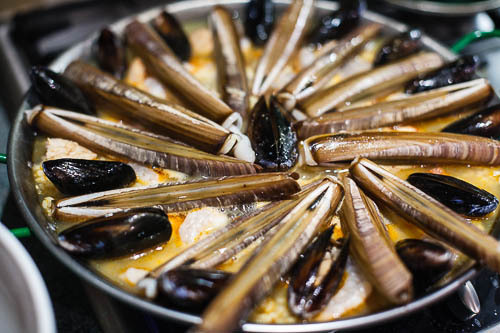 When it comes to razor clams you can prepare them a couple of ways. 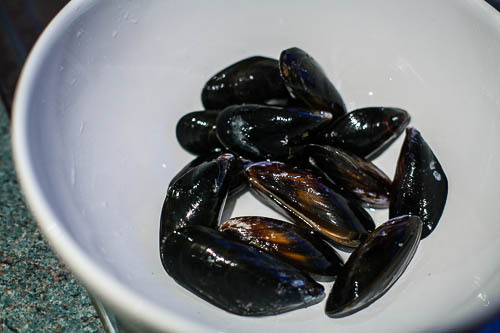 You can blanch them for a moment until the shell pops open before plunging them into iced water and trimming the meat. You can then add them to your dish for a couple of minutes to cook. Or you can cook the in their shells and slice them once cooked. Either way they do best given a light hand. 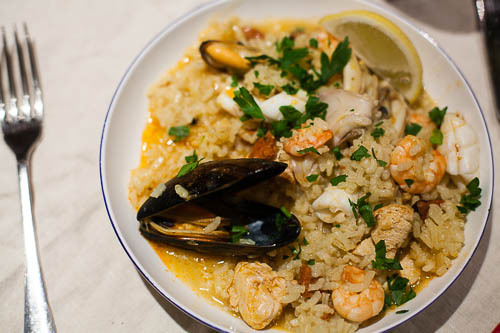 Although I’ve titled this seafood paella it is a paella mixta as I include chicken. I don’t use tomatoes for two reasons; firstly I’m allergic to them and secondly I’ve never had tomatoes in a paella in Spain. Plenty of recipes use them but it’s just not for me. By all means use whichever shellfish and seafood you can for this recipe. I have used squid, muscles, clams and prawns as that was what was available to me. I have a paella pan which I use. Cooking with one takes a bit of getting used to as they are much thinner then my other pans. I find it’s best to keep the heat low and increase it as needed than to have it too hot and burn the food. To serve – chopped parsley and wedges of lemon. Serves four to six people depending on appetite! Prep all of your ingredients beforehand unless you have a co-chef! Heat the stock and steep the saffron in 800ml of it while you work. Gently heat the oil in the pan and add the cubes of chorizo. 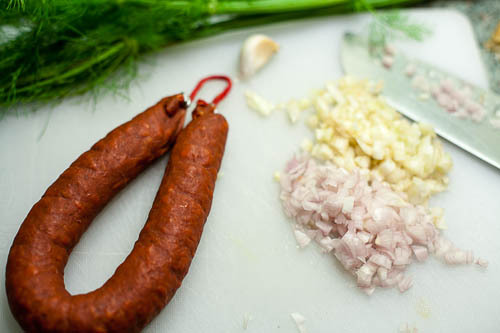 When the chorizo is sizzling add the onion and fennel to the pan, squeezing in the garlic a moment later. As the vegetables soften pour in your rice and let it absorb the delicious juices from the pan. Once the rice has soaked up the flavour you can toss in your wine or vermouth if you’re using them. Sometimes I do sometimes I don’t and either way it’s nice. Add the hot, saffron infused stock and allow the pan to simmer gently for 20 minutes. 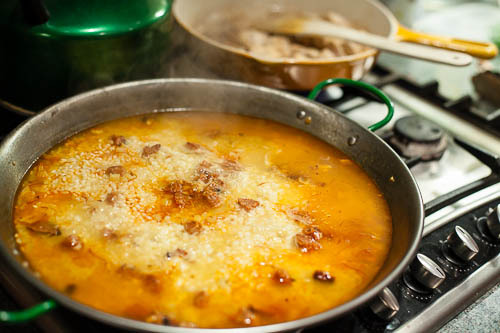 Give the rice a turn once or twice but you can leave the paella to cook alone in a way that a risotto couldn’t bear. Near the end of your 20 minutes brown the chicken in another pan and add it to the rice. By now most of the liquid will have been absorbed and you can add a little of the remaining stock. Place your seafood on top of the rice where it will steam in a couple of minutes. I’ve seen people in Spain cover the top with tinfoil at this point and either leave it on the hob or place under the grill to finish. 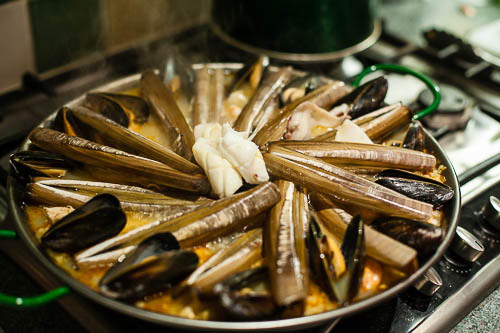 Once the squid has curled and the shellfish have opened* your paella is ready to serve. Scatter chopped parsley over the top and add a wedge of lemon to each plate then dish out at the table. *It would be remiss of me to not mention safety when dealing with shellfish. Wash them under cold water before cooking, any which do not close: discard. Any which do not open during cooking also discard.